One would think my taste in films, particularly spy films, would include Cold War-era stories. Spy films are great, U.S.-Soviet tension leads to suspense, and oh yeah, James Bond films heavily feature that era. 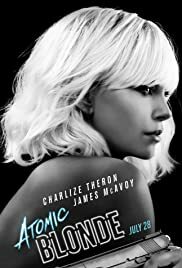 So Atomic Blonde should be a license to fire my enjoyment axons in my brain. For the most part I did enjoy Atomic Blonde and if it they made a sequel or something I’d probably go see it, but I was left wanting a bit more. Perhaps I just have something against stories revolving around the Berlin Wall. The Bridge of Spies was an utter disappointment and dealt with similar East vs. West conflicts, albeit through legal negotiations instead of physical combat. That being said, Atomic Blonde had more than just Lorraine Broughton (Charlize Theron) displaying her bad-assery. Violence, particularly hand-to-hand combat, features heavily in Atomic Blonde. The fight scenes are well choreographed and clear to distinguish who is fighting who, something often lost in the fast-cut, camera-shake blur that often arises. More entertainingly is the concept that you don’t know how the fight is going to turn out. Obviously Lorraine survives (though heavily bruised) because the film is framed in a flashback during Lorraine’s debriefing session at MI6, but there is a wide mix of hands, guns, knives, and an assortment of household weapons. I’ve been listening to the back catalog of Hypercritical where John Siracusa briefly mentioned one of the reasons he liked the Bourne movies so much (compared to some other spy/action film I can’t remember) is the reliance on skill. By eschewing guns for the most part, Lorraine is really showing her spy chops at a level much more impressive than James Bond who has gadgets to rescue him in a pinch. Vastly different styles – I like Bond films primarily because of the gadgets and Bond’s ingenious use of them – but it is rare to see a fight scene nowadays when it’s a mystery how a skirmish will end, even knowing the main character survives. As I said though, Atomic Blonde has more pros than just great physical combat. It is also very mysterious with a few puzzles to think through. Who is Satchel, a double-agent, is a primary question; who has “the List” is another. Inherently in a Soviet vs. Britain vs. U.S. story there will be a lot of intrigue and suspense (well at least here there was, not so much in The Bridge of Spies). However, I am left wanting a bit more. James McAvoy delivered quite a lackluster performance as David Percival, and seeing as he was the main contact in East Berlin, a vital piece to Lorraine’s mission, it ruined a lot of the urgency in the film. While there is a bit of a twist towards the end regarding Percival, by that point in the film I couldn’t care less so the twist was lost on me. Large sections of the film also brought up memories (not fond ones) of Tinker Tailor Soldier Spy – a film I’ve attempted to watch twice and have fallen asleep both times. That’s the most puzzling thing to me and why I’d be open to seeing a sequel or something else in this story’s universe – the basic premise I was behind 100% and the action kept me invested until the end, but at a fundamental level the mystery (while nonetheless mysterious) was also vacuous. I liked Atomic Blonde but I ought to have liked it more than I did. Theron is amazing, McAvoy is a hard pass, and director David Leitch (who also helmed John Wick which I rated highly) shows promise. A film I would definitely look into, but not a strong recommendation for needing to go see it.